A kitchen at a community centre used by soldiers and civilians living at Pirbright army camp in Surrey has been officially opened after being refitted. It is the latest project in a programme of improvements at the Jubilee Centre, aimed at helping to integrate civilian families and military personnel. A children's play area has already been opened on the site. Woking council's housing company, Woking Borough Homes, bought 49 former married quarter properties in 2009. They have been used to provide affordable rented homes for local people. The Ministry of Defence used the funds raised to refurbish its remaining accommodation. 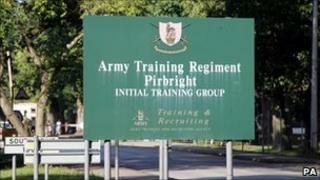 Pirbright is home to about 2,000 soldiers and their families. It houses the 1st Battalion, Royal Anglian Regiment, which has recently returned from Afghanistan, and the Army Training Centre.